Low power CMOS VGA(640×480) Image Sensor with embedded real time JPEG encoder, and Parallel 8-bit Host interface for fast access. 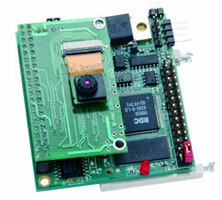 The EyeJ (EJ) color image sensor module is an affordable solution for high quality, embedded image acquisition. It is designed to be driven by TERNs C/C++ programmable controllers, like the Ethernet-Engine or FlashCore-B. 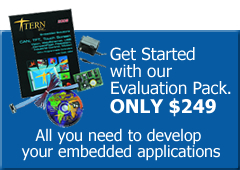 The EJ integrates a VGA(640×480 pixels) CMOS color image sensor, embedded JPEG encoder, wide viewing angle micro lens, and a high speed parallel host interface. Using the embedded real-time JPEG encoder for compression greatly reduces image file size. A raw VGA color image file can be more than 300KB+, and require seconds to process and transmit. In contrast, a real-time compressed JPEG file can be 30KB typically. The reduced image size allows real time image transfer over RS232, Radio MODEM, USB, Ethernet, or storage into a CompactFlash card. by PC-compatible FAT16 CompactFlash storage. Embedded real time JPEG encoder. Parallel 8-bit Host interface for fast access.